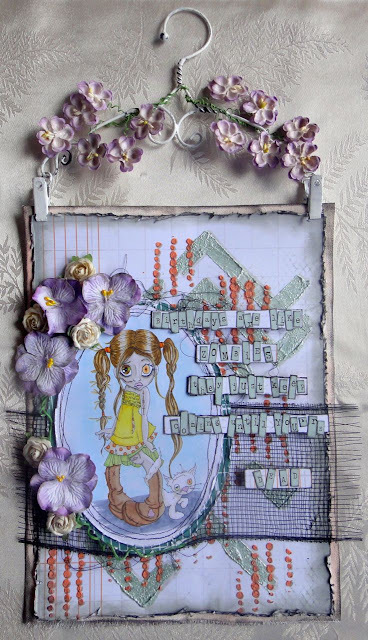 Today I have a couple of pages created in the Donna Downey Art Journal, included in Flying Unicorn's December Mixed Art Kit. I love how this page turned out.......but I need to work on how I managed to do the holly branches and the white 'snow'. I actually stamped with Versamark, and then white embossed over top. Once cool, I added my colors over top, and let that dry. Then I ironed off the embossing....a bit trickier than I thought, but I love the effect!!! I did go back and add the leaf outlines with the Pitt Pen. This is actually half of a two page spread. I had problems with the other half, and I need to re-work it. Unfortunately I didn't get it done in time for the reveal. Maybe I'll work on it this week!! 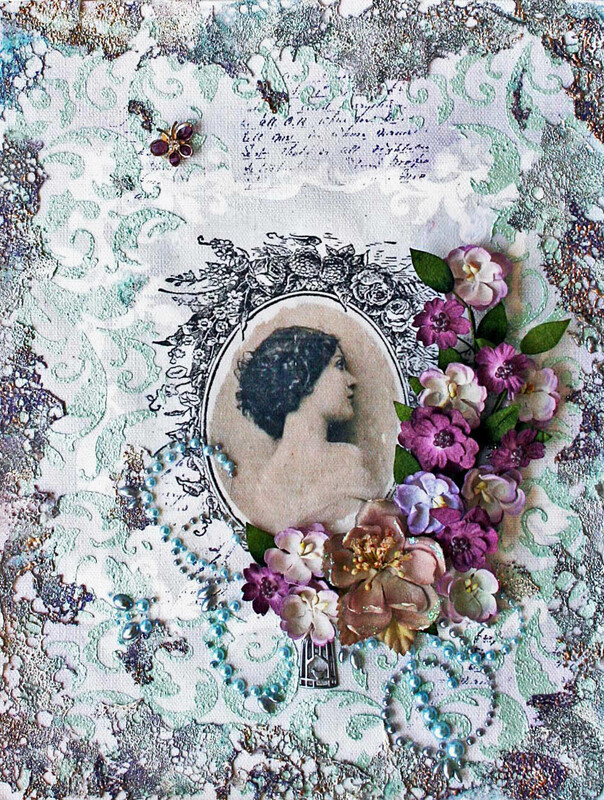 I first collaged on some of the journaling cards on my background, and then added gesso over top. A bit of stamping, some spray, mica powder, Creameez, etc over top. A very simple page, and the one that inspired the cover!! See that post here. 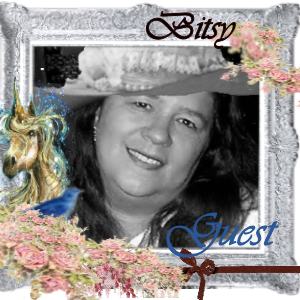 I just wanted to let you know, that I am up on the Flying Unicorn Ustream Channel, this Wednesday, June 24th, at 9 pm EST. So excited, and I cannot wait to share this project, featuring Dylusions paints and Prima flowers!!!!! Permanent Ink - Green & Brown such as StazOn, Memento, etc. Today I am sharing the canvas I made using the Flying Unicorn Mixed Art Kit. This was a totally different look for me, and I was working with a new to me product. Included in the Kit, is a set of Royal Langnickel Artist Pastels!!! I have to admit, that I have issues with pastels....all of them.....I just don't know how to use them.....but I played with them anyways. The entire canvas was covered with purple and blues, and then I added a bit of black here and there in the sky. The water looked too much like the sky, and I wanted texture in the water, so I added some molding paste, and then painted the water area with black gesso, to make it darker. I should point out, that if you are going to play with pastels, you need to use a fixative in between each color layer, to preserve it. You also need to fix the final layer, so that the pastel won't rub off, I used Spectrafix, which I had on hand. The eiffel tower was created using Sheena Douglas's Eiffel Tower Stencil and Ranger Archival Ink in Jet Black. From the stencil, I added a few more trees, just to balance the composition. And then it was time to highligh the tower.....with Lemon Drop Shimmerz Dazzlerz!! I am amazed at how opaque the yellow is!!!!! It really makes the tower pop. Next, I added some of the Lemon Drop in a few areas of the water to create a reflection. The silver microspheres are from 13 Arts, and really set off the shoreline. I also took the Fabscraps Frame chippy, cut it appart, covered it in black gesso, and glued it on my canvas. The trees took on a life of their own too. I had added some of the Lemon Drop, as well as Shimmerz Texturez in Mari-Gold Digger and Ranger Liquid Pearls in Onyx Black. Very cool, but the trees competed too much with the tower, so I added black gesso over top, but didn't cover all of the color....so you get little glimmers of the three different colors. For a final touch, a bit of sprinkling/splattering of Shimmerz Spritz in Tuscan Sun, to create some stars in my sky. Today I am sharing my canvas made with the Flying Unicorn Mixed Art Kit. The MA Kits are my favorites from all of the kits every month. It's the one I look forward to seeing the most. Alda always includes awesome goodies to play with, and this month was no exception.........an 18 color paint set!!! So I chose my fave colors, took some inspiration from Finnabair, and I started playing! There are a ton of layers of paint and mists on this canvas!! One of the things that I have been working on lately, is finding ways to layer paint over mist, without ending up with a mess! Enter Krylon Workable Fixative! Love that stuff!!! If gesso is your BFF, then the WF, needs to be your second BFF!!! 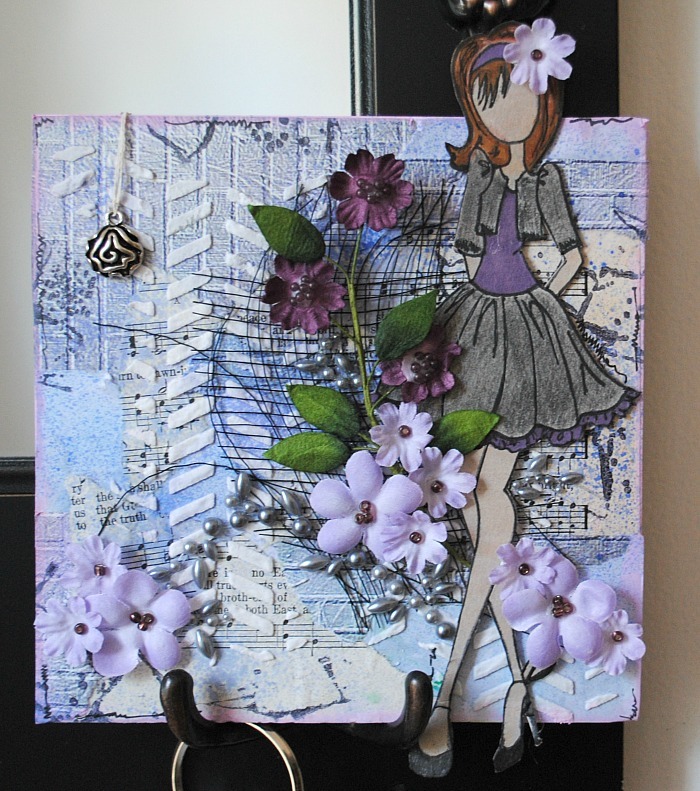 So I started with paint, added stenciling with the Shimmerz Moody Mauve. Sealed the piece with Krylon WF, then I layered on more paint, and then more spray, and then the WF. And I continued the process until I was happy with the background. Now I know you can't see all of the sprayed layers, as they are very pale in comparison to the paint, but trust me, there's probably 4 layers of mist/spray under that paint and fixative! If you're going to do a Finn inspired piece, then the next step is to add tons of layers of flowers, metals, wood, doodads and anything else you might want on your piece. I set about glueing down all of the embellies, and then I added a layer of black gesso over top, and then sprayed on Shimmerz Bamboo Leaves, Oh Say Can U Sea and Moody Mauve over top. One of the other bonuses to using the WF, is that, any over spray, can be wiped off with a damp cloth or baby wipe! I wanted a few flowers and other embellies to stand out, so I gessoed (white) them separately, and then sprayed them apart from the canvas. Once the black gesso/sprayed background was done, I glued on the lighter flowers. On this section of the canvas, you can see more of the spraying.....there's Moody Mauve and Bamboo Leaves on that background. Next up was stenciling with my mix of gesso and molding paste in white. I was planning on adding a title to this piece.....From the Depths of My Soul....because the canvas is a reflection of how I was feeling at the time. But, I couldn't figure out where to place it without crowding the 'negative' space between the dark and the light areas. So I chose to not add the title. I should probably point out that the Krylon Workable Fixative, needs to be sprayed on outdoors! It has a very strong smell, even after it's dry. Though after a couple of days, the smell dissipates. So if you are going to use it, beware, and use caution when working with it. 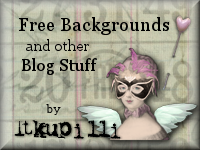 I have a feature post, today at the Flying Unicorn! This time, an Art Journal Page. Think you can't do this on your pages? Well.....head on over to the Flying Unicorn Forum, to find out how easy peasy this page was to do!!! Seriously, very easy!!!! Check it out!! 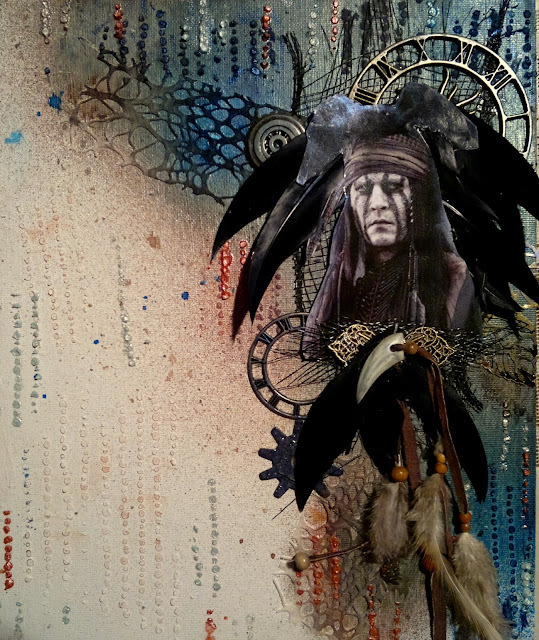 Today, I am sharing my final project as Guest DT for Gauche Alchemy. 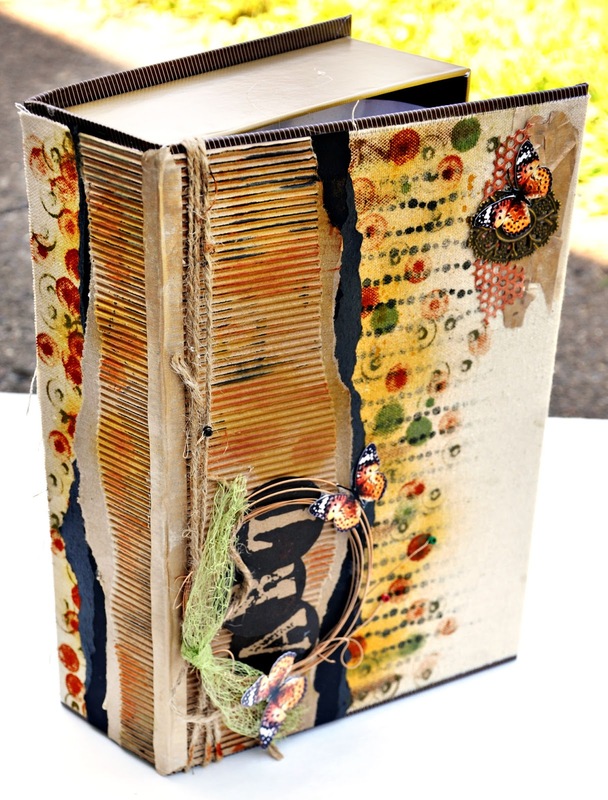 If you've never seen Gauche Alchemy's Kits ...you need to check it out!! They are jammed packed with all kinds of vintage ephemera, and goodies that will totally surprise you!!! Before I show you my last project, I want to thank Chrissy and Maggi, for inviting me to Guest DT!!! I had a blast playing with the Happy Housewife Kit.....here's a peek of what's included in the kit........shhhhhh, don't tell anyone, but, I stole the pic, so you could get an idea!! I had a 12 X 12 canvas in my stash, and decided to alter it, with the napkin, washi tape, wallpaper piece, vintage catalog and magazine pages in the book. Of course I used gel medium to adhere the papers down, then I added some watercolor paints in large spots all over the canvas. Yuck!!! the colors were way too bright! I was able to wash some of it off, but it was still a bit much....so out came the gesso!! A bit here, and a bit there...getting better!! It was time to place the main image down, which was an advertising piece for a home heating system, as well as a few more bits of the magazine papers. Much better! This is the right side of the canvas. I used Golden Molding Paste through the Grid Lock stencil by Momenta, which I purchased at AC Moore...so it's used primarily for home decor. Next, I pulled out my Lindy's Stamp Gang sprays, and sprayed over the molding paste only. I used Plumeria Pink, Pink Ladies Pink, Frenchy's Pink Pouf, Wicked Witch Purple and Tears On My Pillow Tangerine. I made sure to wipe away the excess from the main image. As you can see, the molding paste held the color quite nicely! It still needed a bit more color, so I took out Mother of Pearl Hydrangea Modellier Creme from Viva Decor, and ran that through anoher stencil, this time Mini Ceiling Tile from Crafter's Workshop. Yum, yum! See the cookie cutter....I embedded it within the canvas!! Easy peasy to do too!! Just trace around your shape, cut within the line, and force that puppy through!! Make sure you glue around the edges, on the back side. I did back the heart with lace and a vintage receipt. Ok, so I can't draw that well, or follow lines very well.....but, I colored in the alphas, to match the canvas. I started with Faber-Castell Stamper's Big Brush Pens in Pink Madder Lake....didn't like it, so I went over it with Deep Scarlet Red, and then outlined it with their XS pen in Black. I also went around the entire canvas with Ranger Archival Ink in Jet Black, to ground it. Overall, I am really pleased with this piece!!! It will definitely hang in my craft space!! I'm very sad that this is my final project for Gauche Alchemy....I had so much fun!!! I seriously want to do more!! This kit, totally kept me thinking, and playing outside the box!! A huge thank you to Chrissy and Maggi!!!! You are both super awesome, and you really went out of your way to make it easy and fun for me!!!! Thank you ladies!!!! I am so over the top excited to be Guest Designer, this month at Gauche Alchemy!! Love their kits!! They are full of vintage goodies and ephemera, and odds and ends, you won't find anywhere else!! For my GDT spot, I got to play with the Happy Housewife Kit....gorgeous!! 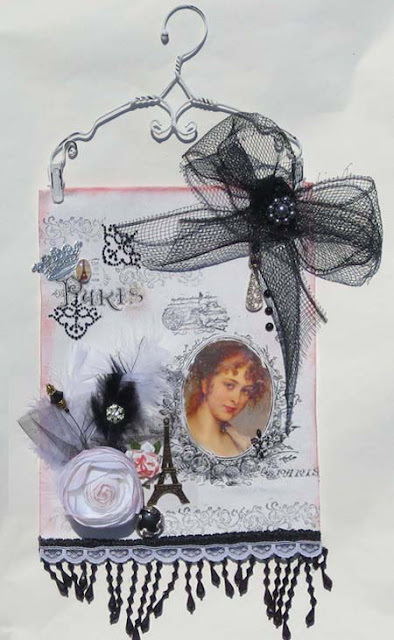 Gauche's kits, really force you to think outside of the box!!! That is not a frame, ladies and gents....that is a stainless steel tray, included in the kit! I fell in love, and had to turn it into a frame. I first painted my piece pink, then glued down a catalog page, and the doily over top. I felt it needed something on the border, so I added some Modellier Creme from Viva Decor using a stencil I purchased at AC Moore. Some stickles dots carried my theme throughout. 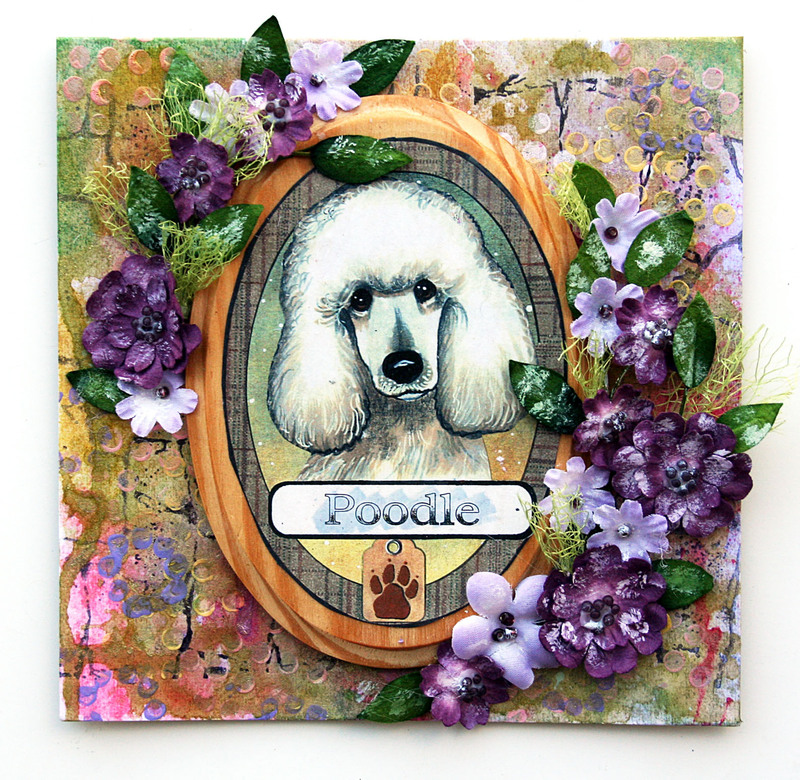 That is one of Julie Nutting's stamps from Prima.....I think that's only the second time I've used it. I stamped her on a book page, then on a red napkin (kit) as well as on an old envelope, also in the kit. I added more stickles to her top, skirt and shoes. The skirt was colored with Distress Ink in Black Soot. The wallpaper piece in the background was stencilled with Mini Flower Frenzy from Crafter's Workshop and Pan Pastels in Magenta Extra Dark. The cameo 'pictures' are washi tape (kit), and I fussy cut a Hambly Screen Print chandelier. My title was printed from my computer, and yes, you guessed it....stickled!! The red ribbon and the black velvet flower, were also included in the kit....I just added a few mini roses, to complete the look. I am very please with how my frame turned out!! So if youare looking for something that is totally different, then you need to check out the Gauche Alchemy store!! You won't be disappointed!!! Happy thinking outside the box!! I'm so excited, and totally amazed at myself....I've made my first ever video!! 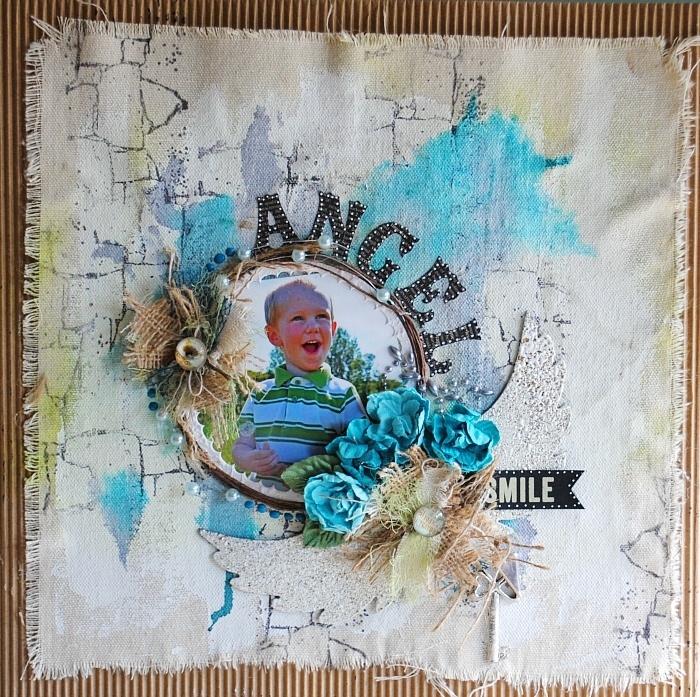 And it's one of my DT Projects for Lindy's Stamp Gang!! That's a whole lot!!!! In the video, I show you how to add texture to your chipboard, using Lindy's Embossing Powders and Starburst Sprays. Anyways....It was quite the learning curve!! Filming was easier than I thought....I talked much longer than expected! Editing....there are no words to describe....let's just say that I almost gave up completely!! Nothing like reading the instructions, on the editing program, and it's completely backwards from what you're supposed to do!! UGH!! I got through it.....could have edited more, but after 5 hours on it, I'd had enough...sorry!!! Uploading the video to YouTube was another major challenge!! My video got hung up for about 3 hours. I finally cancelled, and decided to try Google Chrome as my browser.....it was up in less than an hour!!! Having said all that, I can't wait to make another one!! I learned a lot during this process, I know more of what to do, and what NOT to do! So, you have to put up with a longer video than expected, and I made a few rookie mistakes, plus I totally flubbed up the name of one of the sprays! Oh well! So here's my layout, and I'll tack on the video, and then show you some closeups. 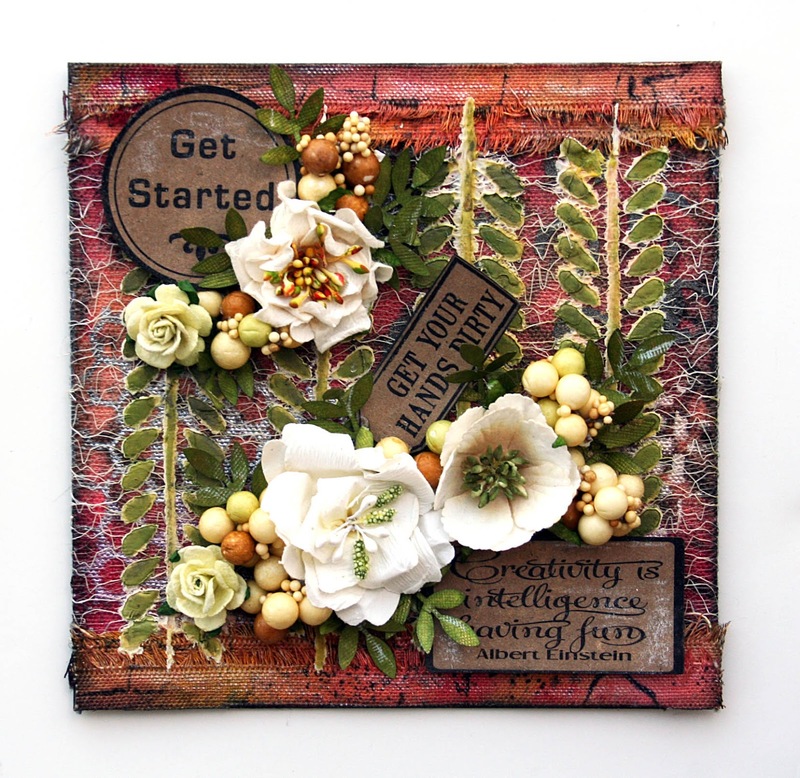 We are so excited to showcase our July Mid-Month Muse Kit. 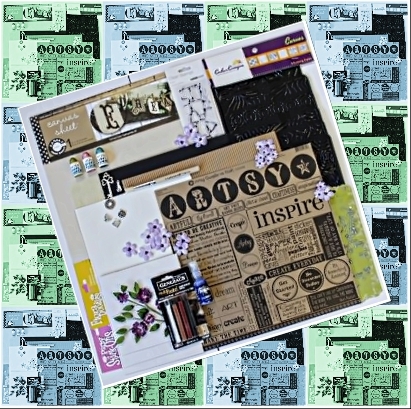 This kit allows you to experiment with Watercolor paints, photo transfers, gelatos and so many more goodies that your creativity can explore. We are also thrilled to include and introduce to you all our Flying Unicorn crystal butterflies, that are available for now only in this kit with some new adornments under our brand as well . So without further adieu take a look at the amazing creations created by our creative team and Brenda ( Bitsy) Howell, our Guest Designer. CLICK HERE TO GET YOUR MID-MONTH MUSE KIT TODAY ..